This morning I found out that a sweet little boy we’ve come to love from our CDG family passed away in his mothers arms. I sat staring at my computer screen for what felt like an eternity trying to find the right words to say to this amazing family who had just lost their son. I’m sorry had been said so many times but what else is there to say. My heart feels like it has been broken into a million pieces and even though I’ve never met this sweet little boy in person he is family and I can’t stop crying and thinking about how hard this must be for them. I went into ladybugs room early this morning and picked her up and held her so tight trying to muffle my tears so I wouldn’t wake her. Each time a child from our CDG family passes away it unlocks that box that I keep trying to hide deep inside me. It makes the horrible things that this disorder is capable of seem to move from a possible prognosis on our children’s medical files to reality. I feel like I’m in an after school special waiting for the heartwarming music to begin when I just keep saying it isn’t fair! It just isn’t fair! There is no treatment for CDG, there is no cure for CDG it just isn’t fair! My heart goes out to the family – I really wish I had the words to say to take away the pain that they must be feeling. I wish there was more I could do. Ladybug is cozy in my arms now, chatting and soaking up every ounce of the continuous snuggles she’s received so far today. I must be strong for my daughter. It’s okay for us to fall apart every now and again – we’re human. 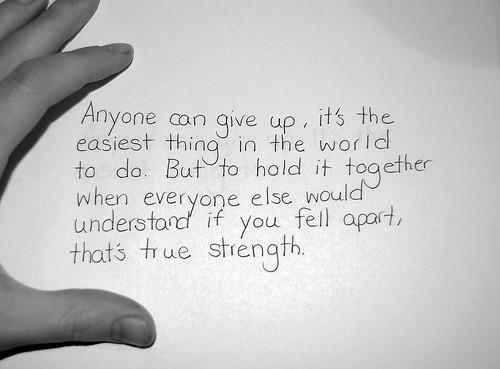 It’s the strength we find deep within ourselves even when it looks impossible that helps us get through those times. I came across this on one of the groups for parents of special needs children I belong to – it is so true. Just remember… you NEVER stand alone! What a beautiful write up!! I have watched you grow up into an amasing woman, and an amasing mother to your beautiful ladybug!! You are a huge inspiration to me and to many others!! I am blessed to know such an amasing individual!! Luv always Tammy & Ray. I know the family you mentioned here and my heart is breaking. This precious little angel will never be forgotten. Praying for you Melissa. Hugs!